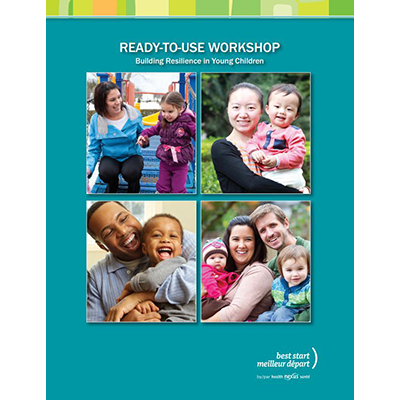 The purpose of this manual is to provide service providers with what they need to lead a workshop for parents about how to build resilience from infancy to age 6. The content of this parent workshop is taken from the Best Start by Health Nexus resource: Building Resilience in Young Children, a booklet for parents of children from birth to six year, available in English and French. This Building Resilience in Young Children ready-to-use workshop is also available in French. Activities. See pages 7-18. (30-45 minutes). For the first session, Activities #1 and #2 are strongly suggested. For subsequent sessions, you can choose from activities # 3 to #7. Participants learn about resilience and its importance for child development. Participants reflect on ways to be positive role models for their children. Participants learn ways to boost their children’s ability to bounce back from life’s challenges and thrive. Everyone has the capacity for resilience. Building resilience is something we work on throughout our lives. Parents are the most important people in their children’s lives. They have the biggest role to play in helping their children develop strengths that support resilience. Together, with the support of other caring family and community members, you can boost your children’s resilience through your everyday interactions and role modeling. All children are different – there are no magic solutions to build resilience in children. Being flexible with approaches and maintaining a caring relationship with children are the most promising ways to enhance children’s capacity for resilience. Taking care of yourself makes you healthier, better equipped to parent and able to meet life’s challenges. Children watch and learn positive self-care strategies from their parents.